﻿ Shui Lam (International) Textiles Enterprises Ltd.
Our production plant is located in Tianjin (China). It has a manufacturing area of 90,000 SQM, well equipped with 60,000 spindles & 1,200 skillful labours are working there. The annual production capacity exceeds 7,200 tons. We are proud of its perfect management system and the strong base of technological back up. Situated in the vicinity of the Tianjin seaport – Xingang, our factory is of easy recognized and well connected with the developed highway system in north China. We can therefore assure our worldwide customers of prompt goods delivery. At the same time, we can also secure the on-time receiving of the imported fibers for our production. The manufacturing of a high quality yarn starts with the fiber selection & sourcing, it needs to be continued in the spinning process. We constantly search for improvements and make sure that our findings are freshly introduced into our production process. 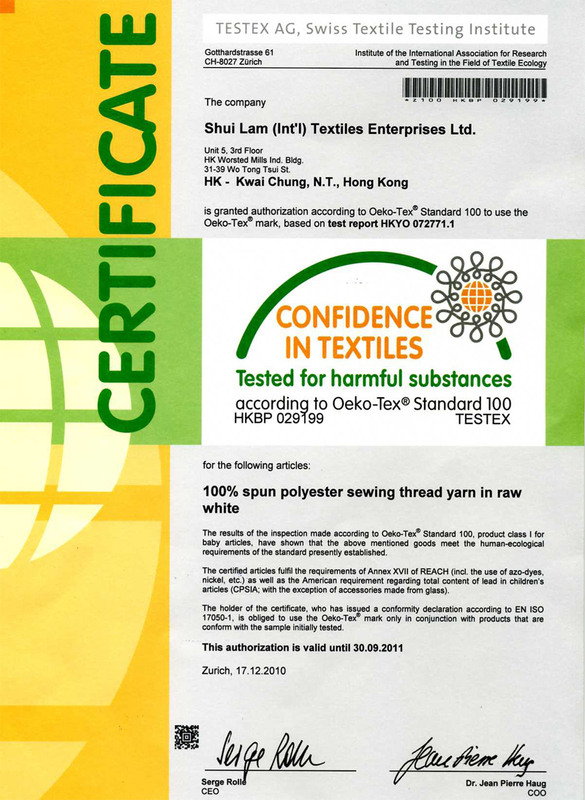 To produce our sewing thread yarns, only the best raw material is acceptable. We are consistently using the best polyester fibers from the world’s premier supplier "PENFIBRE". With the big volume yarn production by our 1,200 skillful workers of good sense in the quality consciousness, self-improvement and team spirit, the manufacturing plant of Shui Lam is where it all begins. Upon arrival of the polyester fibers from “PENFIBRE” to our factory, the yarn manufacturing process begins. 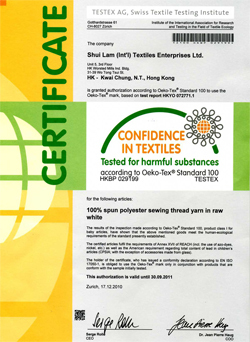 Our yarn was benchmarked with the Certificate of Oeko-Tex Standard 100 over the past 10 years. It is awarded by the Swiss TESTEX & get renewal continuously in every year.